After much discussion, Donald Trump finally picked his running mate, Mike Pence. He is the governor of Indiana, and a reliable conservative politician. He is best known for his strong anti-abortion views and the signing of into law of anti-gay rights bills. Pence is soft-spoken, and makes self-deprecating jokes about how boring he is. As a soft-spoken conservative political insider, he couldn't be more different than Trump. Analysts think Trump chose him to balance out his personality and to appeal to conservative voters. The announcement itself came with some drama; Pence being chosen was prematurely leaked to the press, and Trump later asked his aides if he could choose someone else after the press called his VP choice boring. 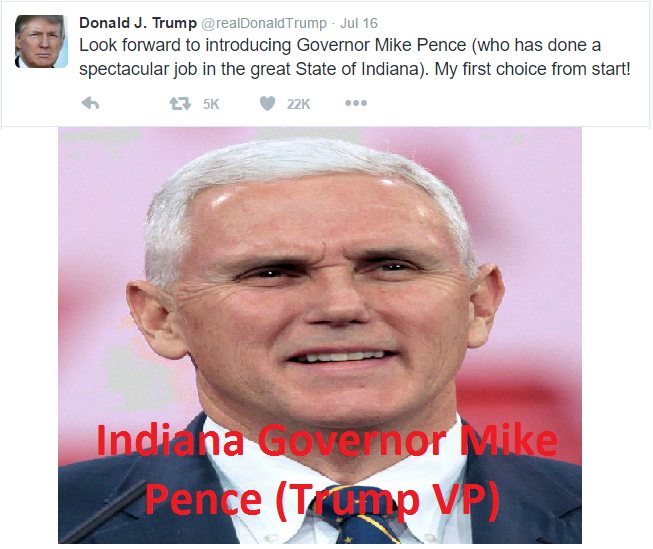 Now Trump denies anything and says he is happy to have Pence on board. With his VP pick, Donald Trump headed into the Republican convention in Cleveland last week, which is where Republican politicians from across the country gather and officially declare the nominee. The #NeverTrump movement made its last stand here, by trying to get the Rules Committee that makes the rules for the convention to let delegates (people who represent the voters of their state) vote for whoever they wanted rather than how the people of their state voted. This would possibly allow Donald Trump to lose even though he received the popular vote. This attempt failed, and the convention went on. The speakers were mostly pretty boring. Instead of politicians, there were (not too famous) celebrities, an optometrist, and an avocado farmer. The only notable speakers early on only on were Chris Christie, who attacked Hillary and caused the crowd to chant, "lock her up! ", and a mother whose child died in Benghazi and blames Hillary Clinton. The speakers in the convention were notably unsubstantial, speaking little of policy and mostly speaking ill of immigrants. The first big event was Melania Trump (Donald Trump's wife)'s speech. 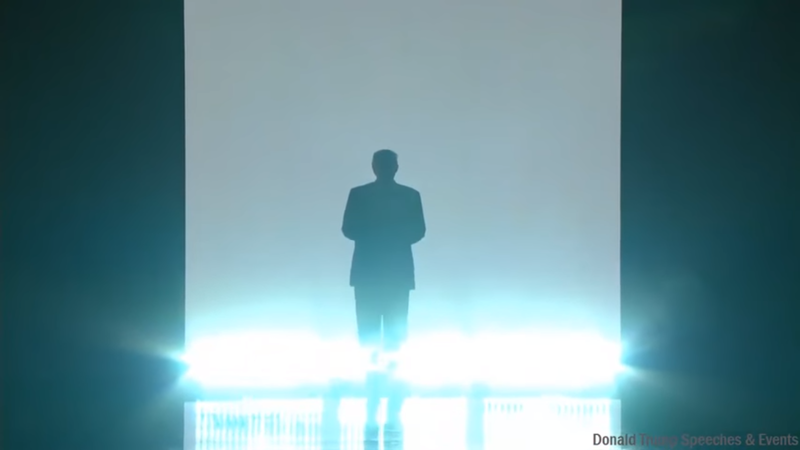 Donald Trump, who was not supposed to appear until the end of the convention, but couldn't help making the flashiest ever entrance to introduce her. He entered through smoke-filled air with the song "We are the Champions" playing. Melania herself delivered the speech fairly well, but after the speech the press found that she had plagiarized large sections from Michelle Obama's speech. This largely overshadowed the day. Another significant speech was by Ted Cruz, Donald Trump's main rival. Ted gave a speech for "voting your conscience," which is usually a euphemism for not voting for Trump. He also failed to endorse Trump, prompting a ton of booing. Later, Trump trashed Cruz, again bringing up tabloid conspiracy theories about his father, and saying that he wouldn't accept Cruz's endorsement in the future. Finally, the roll call happened. In this event, each state was called by the stage and reported what delegates went to each candidate. The candidate with at least 1237 delegates would become the official nominee. Here, people were expecting a coup by the #NeverTrump-ers. The delegates could have walked out, made the smallest states go first to delay the nomination, or at least boo. However, the Trump campaign sent people with neon-green hats all over the convention floor to keep everyone in line, so everything went smoothly. The state that put Trump over the magic number of delegates was his home state of New York. His son, Donald Trump Jr. read out the delegate totals and congratulated his dad. Later, he made a speech hoping to humanize his dad. Finally, the last day came and Trump gave his speech to accept the nomination. The speech was one of the longest in convention history, and painted a picture of America as a country in bad shape that badly needed fixing. The convention in general communicated the idea that America is a really screwed place, but did not provide concrete policies on how to fix it. This week is the Democratic convention. After the mistakes made in the Republican convention and the tone of pessimism it set, Democrats were eager to have a more smoothly run convention that conveyed a tone of optimism. Now Bernie had endorsed Clinton, and more and more of his supporters were turning over to Clinton as the attacks against Bernie that agitated them in the primary were fading. However, this went badly. Over the weekend, Wikileaks released 20,000 internal emails from the Democratic National Committee email servers, which were hacked by Russians. Sanders supporters long saw the Democratic National Committee as pro-Hillary for various reasons: it scheduled debates between Bernie and Hillary at times when very few viewers would be watching (supposedly to help Hillary), closed polling stations in states Bernie was likely to win in, and accused Bernie supporters of violence during the Nevada convention without concrete evidence. Not to mention that many of the top DNC officials worked on Clinton's campaign in 2008. The emails provided unquestionable evidence of the bias. People in the DNC called Bernie and his campaign manager foul names. Debbie Wasserman Shultz, the head of the DNC, said Bernie would never be president and implying that he could be would be "silly." This was late in the primaries, when Bernie was not far behind Hillary in the polls, and still could win. Other emails snubbed Bernie supporters. But worst by far, the CFO of the DNC sent an email saying that he wanted to plant a story in the media that Bernie was an atheist, despite Bernie being Jewish. He said that could turn off voters in the upcoming states that were going to vote, and hopefully make Bernie lose. It also shows the embarrassing lengths the DNC went to court rich donors. This was more evidence of the corporate corruption that Bernie supporters hate. This created a firestorm online, and enraged Bernie supporters who were starting to fall behind Clinton. Debbie was the main target of ire. Here is Debbie in her home state of Florida. Over the weekend, Bernie Sanders called for Debbie's resignation. This Sunday, she said she would resign by the end of the week. She also gave up her role speaking at the convention, probably trying to avoid a scene like Ted Cruz's speech, where he was booed off the stage. Bernie gave a speech before the convention calling for unity, again endorsing Hillary Clinton. His own supporters loudly booed him when he said this. Later, he sent a text message to his supporters and delegates asking them to not protest. This message didn't affect much. Yesterday, the first day of the convention, got off to a rocky start. Protests outside the convention raged. Inside the convention hall, about a third of convention-goers were still carrying pro-Bernie signs. Any mention of Hillary Clinton's name set off loud booing, and chants of "Bernie! Bernie! ", which were met by chants of "Hillary! Hillary!" However, a speaking lineup of Michelle Obama (the First Lady), Elizabeth Warren (Democrat from Massachusetts, a big leader of the progressive movement), and Bernie Sanders himself helped the situation. Michelle Obama's speech was widely well received. She personalized the election, asking people to think about what example the president would set to their children for at least the next four years. Elizabeth Warren and Bernie Sanders enthusiastically tried to convince progressives to vote for Hillary, and for once weren't met with boos. After all of his opponents dropped out, Donald Trump cruised through the primaries. Most Republicans unified behind him, though not enthusiastically. Still, many notable Republicans like George Bush (former pres. ), Lindsey Graham, and Mitt Romney (2012 Rep. nominee) still do not support him. This has not affected Republican voters much. As these voters fell into line supporting Trump, his poll numbers surged, tying him with (almost definite) Democratic nominee Hillary Clinton. However, Trump damaged this himself when he made comments about a judge. In a case, students of Trump University (not an actual school) are using Mr.Trump for fraud. They paid thousands of dollars, and only received a short seminar that was not taught by Trump. Come on! It's in the name! In the case, judge Gonzalo Curiel did not throw out the case, and Trump lashed out saying the the judge's Mexican heritage makes him biased against Trump. For maybe the first time, the controversial attack stuck to Trump, maybe because he was directly insulting an American citizen on race. The Republican speaker of the house, Paul Ryan, called Trump's comments "textbook racism" even though Mr.Ryan himself continues to endorse Trump. This drew strong criticism and eroded his support. Later, Trump came under strong criticism for...a tweet. Again. He published a meme of Hillary Clinton calling her the most corrupt candidate ever over the background of dollar bills, with a five-pointed Holocaust star. His campaign quickly deleted the tweet and replaced the star with a circle, but it was too late. Media outlets discovered the image came from a neo-nazi message board. And no, this isn't even the first time Trump has retweeted neo-nazis. Trump brushed off the comments as nonsense saying that he only retweeted it and that it was only a sheriff's star. This further decreased Trump's supported, and Hillary went from being tied him to being (in a RealClearPolitics poll average) almost five points ahead of him. Hillary Clinton swept the northeast, dealing a blow to Bernie's campaign. He had a very small chance of winning, if he won the largest state in the country, California by a landslide. However, Hillary Clinton won California by around 12%, and the race became effectively over. With her superdelegates, Hillary Clinton had the necessary number of delegates to be the nominee. Despite it being mathematically impossible for Bernie to win normally, there was still one thing hanging over the entire race: Hillary Clinton's email investigation. Hillary Clinton had used a relatively unsecured private email server and mishandled classified email while Hillary was the secretary of state. If the FBI did their investigation and concluded that Hillary would need to have a trial, as directed by the Department of Justice, Hillary would be part of a criminal investigation in the middle of the election, which would be a sure disaster for the Democrats. The superdelegates would almost surely decide to support Bernie, as Hillary would be a very risky candidate to send into the election against Trump. This issue came to a head this week. An closed-door meeting between Loretta Lynch, the attorney general who may have to investigate Hillary Clinton, and Bill Clinton took place in Pheonix. This sparked a flurry of suspicion for obvious reasons. Loretta Lynch and Bill said that they were just talking about their grandchildren and other personal things, but personally it seemed odd that Bill and Lynch were on such friendly terms, and that they didn't allow anyone to record their conversation. Both admitted that even though the meeting was innocuous, it was a mistake just because of the appearance it created. Only day before yesterday, the FBI director James Comey shocked the political world by unexpectedly announcing the outcome of his department's investigation - cleared. He recommended to the Justice Department not to prosecute because there was no intent shown. He said that Hillary had been extremely careless with classified information and clearly broke rules, but did not mean to. However, in other similar cases government officials were punished simply for being careless - they did not necessarily have to show intent. The next day, the head of the Justice Department Loretta Lynch announced that she would follow James Comey's recommendation, finally slamming the door on the investigation. The Hillary Clinton campaign must be relieved to move past the issue. However, Donald Trump took to Twitter, saying that Hillary clearly broke the rules and that the system is rigged. He hopes to not let the issue be forgotten by the public. The Republicans hope to keep the issue in the public eye as well. They called a hearing the day after the final results to interrogate James Comey and determine if he and the investigation was fair. The Democrats speaking pointed out that the Republicans probably wouldn't have called the hearing if the investigation got the result they wanted. This hearing reminded political observers that while the investigation is over for good, the Comey's conclusions about Hillary's recklessness will undoubtedly be used in attack ads. In one particularly cringe-worthy moment for the Democrats, James Comey admitted that the email server Hillary set up containing very important government secrets was less secure than a Gmail account, and much less secure than a corporate email server. This result essentially ended Bernie's chances. However, he will not endorse Hillary Clinton until some of his demands are met. These demands include making the Democratic Party platform (a document that describes what policies it will fight for) more progressive. On clear effect of this is Hillary's announcement that she now supports tutition-free state college for families that make less than $125,000. This is closer to Bernie's plan, which was tuition-free college for everyone. nominee for president. As for Trump himself, he had promised to make this convention more exciting. Trump is know to be a showman who is good at attracting attention, so people are expecting something big. He is looking into hiring sports stars to speak, and will announce the list of speakers soon. In the Democratic convention in Philidelphia, things are not likely to be much better. Hillary is nowhere near as controversial as Donald Trump, and her rallies are rarely accompanied by protests. However, Bernie supporters and progressive groups have been preparing massive protests in Philadelphia. They saw the primaries as being unfairly tilted towards Hillary, the establishment's preferred candidate, and at least want to see her embrace some of Bernie's policies. The housesharing app used by people attending the convention, BernieBNB, has been overwhelmed with demand. The party conventions are important for two main reasons. First, a peaceful convention shows that the party is united behind their presidential candidates. Violent conventions have led to the party failing in the general elections, which is why both parties try to project unity. Second, the speakers at the conventions often gain prominence. In 2004, a little-known state senator (local official from Illinois) gave a speech about hope, optimism, and unity. His name was Barack Obama, and the speech catapulted him to fame and he ran for president in 2008 despite being a first-term senator.